Having argued recently for a bottom up, grassroots approach to fighting the government’s cuts programme, I guess it is now time to start thinking about putting these ideas into action locally. 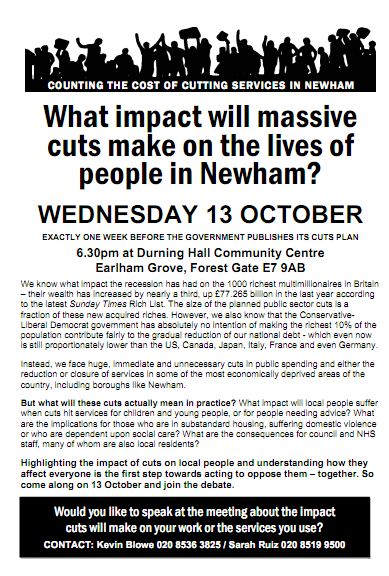 What impact will massive cuts make on the lives of people in Newham? We know what impact the recession has had on the 1000 richest multimillionaires in Britain – their wealth has increased by nearly a third, up £77.265 billion in the last year according to the latest Sunday Times Rich List. The size of the planned public sector cuts is a fraction of these new acquired riches. However, we also know that the Conservative-Liberal Democrat government has absolutely no intention of making the richest 10% of the population contribute fairly to the gradual reduction of our national debt - which even now is still proportionately lower than the US, Canada, Japan, Italy, France and even Germany. Instead, we face huge, immediate and unnecessary cuts in public spending and either the reduction or closure of services in some of the most economically deprived areas of the country, including boroughs like Newham. But what will these cuts actually mean in practice? What impact will local people suffer when cuts hit services for children and young people, or for people needing advice? What are the implications for those who are in substandard housing, suffering domestic violence or who are dependent upon social care? What are the consequences for council and NHS staff, many of whom are also local residents? Highlighting the impact of cuts on local people and understanding how they affect everyone is the first step towards acting to oppose them – together. 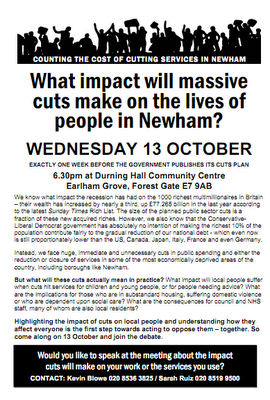 So come along on 13 October and join the debate. The Mayor has made recent announcements that a total £70million in savings are to be made regarding the council budget. These savings will be, in reality, cuts in services. As new councillors, have you been given the opportunity to examine the details of, and as a result scrutinise, the proposed cuts? Have you discussed the cuts at Council or in Labour Group? Furthermore, have you given any consideration as to how you will explain and justify the cuts to your constituents? I sent them a reminder on the 13th. Not one has had the decency to respond. I wrote to the Newham Recorder about this but they didn't run with my letter. Do you know of any way I can get this lack of democratic responsibility on the part of new councillors known to the wider Newham populus?